Well, it was about time I replaced my 2 year old Everton mug, so I went in to Everton One and bought myself a shiny new version yesterday, with the image of Goodison all lit up and the crowd expectant for a thrilling match under the lights. Imagine my disappointment when I got it home and realised there was a crack reaching half way down the inside of the mug. Really frustrating. You’ll by now realise exactly where this metaphor (or analogy, I’m never sure which to use where) is going. Our performance against Swansea on Saturday looked pretty at times, but soon revealed a large crack when we tried to use that prettiness to better effect and carve out a clear chance and a goal. No, I don’t think it’s a very good metaphor either, but I’m trying. For all the huffing and not inconsiderable puffing exhibited by Everton, there seemed no way that they were going to blow down Swansea’s house (another slightly better metaphor perhaps), a visiting team intent on wasting time and breaking up the flow right from the first to the last whistle. But that’s their right, no reason why teams should open up against us and lose, it’s up to the Blues to break their opponents down and only once we get a lead would you expect a little more space for us to move in to. We didn’t manage it I’m afraid, with a laboured and abject performance that frustrated our fans, with very little creative spark to get any amount of excitement-adrenalin pumping. The exception will be the chap sat two seats from me in the UG whose negativity from start to finish was hacking off everyone, but he got to red-faced apoplexy as the game wore on. I hope his little lad next to him has other sources for ‘creative language’ education. Barry gave a passable impression of a centre back once Alcaraz had gone off for more goalkeeper coaching (how did UnFriendly not spot that? ), Jags was ok despite getting turned a little too often by being too tight on a very clever Bony, and the full backs did as much as they ever needed to do, with our tormentor at Swansea in the League Cup – Montero – finely shackled by Coleman, hopefully explaining Seamus’ lack of fizz down the right wing. I say ‘hopefully’, only because he’s not been at his best this season and I suspect our early season’s defensive woes are praying on his mind a bit and making him reluctant to show his more typical swashbuckling style. McGeady flattered to deceive, a phrase which may have been written for the lad, a player who has a pair of the quickest feet I’ve seen, immaculate step-overs, an ability to beat any defender, and a matching inability to pick out a pass to a team mate. Call up McCarthy then for Man of the Match, which probably tells you all you want to know about why we drew 0-0. Typically bustling, more like his normal self of last year, closing down from near and far, and even surging forward and encouraging Voldemort’s lack of judgement about when to body check a man who has overrun a ball that was soon to roll harmlessly into Fabianski’s gloves. A little more shooting though Jimbo, if you wouldn’t mind, sorry for asking and that. Barkley looks a man fresh out of pre season, which indeed is exactly what he is. Some strong runs, some considerable strength to win a ball and hold off a man, and some nice trickery, but too many misplaced passes, and the less said about the attempted cross from our right in front of the Gwladys St the better. At least it only went for a throw in (behind him, if you didn’t see it). Corners. We had 11. Swansea had none. But they looked more dangerous with their no corners than we did with a double figure count of the damn things. I do like to accentuate the positives in life as best I can (struggling today to be fair), but what positives can be drawn from the 11 we had yesterday? In truth, the only good thing to say is that we won 11 corners, which was then swiftly followed by aimless balls that didn’t reach the box on most occasions, or if they did were cleared unchallenged. 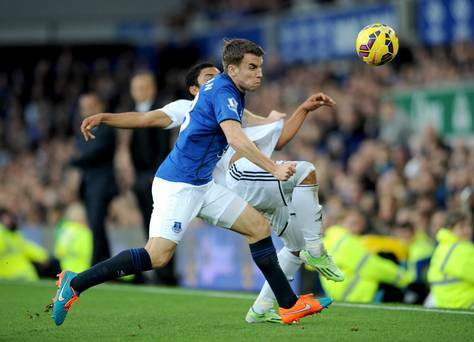 Baines has the sweetest left foot on the planet, seemingly except if the ball is in the corner quadrant. So may I respectfully suggest two things: put one of OUR players on the edge of the 6 yard box for a flick on; or play it deep instead. Sorry, three things: play a short corner routine so he’s hitting a moving ball, which appears to be his forte. I’d suggest a fourth, and let someone else take them, but Ross took a few yesterday to similar effect, i.e. no effect. Come back soon Kevin (er, Mirallas, not Campbell). Right onwards and hopefully upwards. An away game at Sunderland next in the Prem, for whom we can only hope a Blue shirt doesn’t induce a sudden uncharacteristic worldy by Mannone, and before that, we return to Europa League action with a visit from our friends from Lille on Thursday. If we thought Swansea were well organised defensively, I don’t expect much leeway from Lille, so we’ll have to show a bit more flair than we did on Saturday. 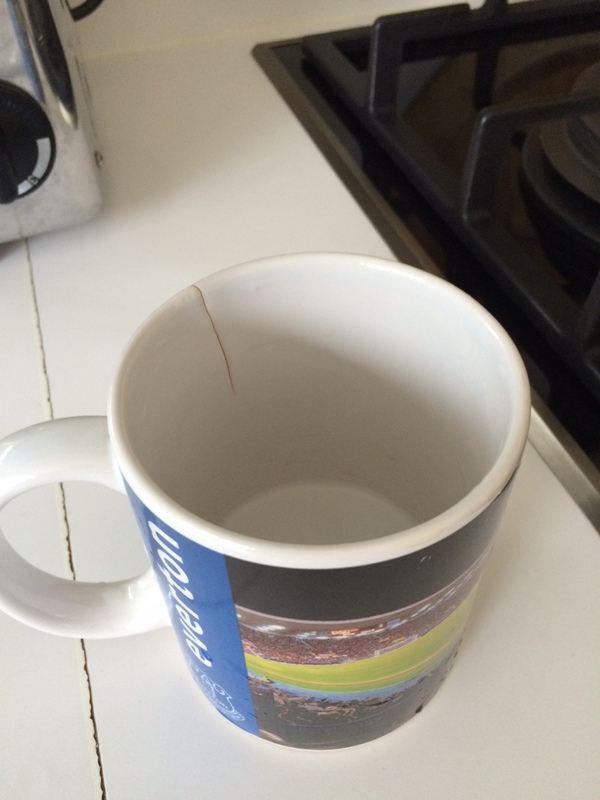 Otherwise, I may just fish that mug out of the bin and let it be my Everton metaphor for the season. As a Swansea supporter, I’d say that was a fair and accurate assessment of the game. Very refreshing to read.